In previous tutorials, we've learned how to extract data from public websites, writing CSS selectors, pagination and more. 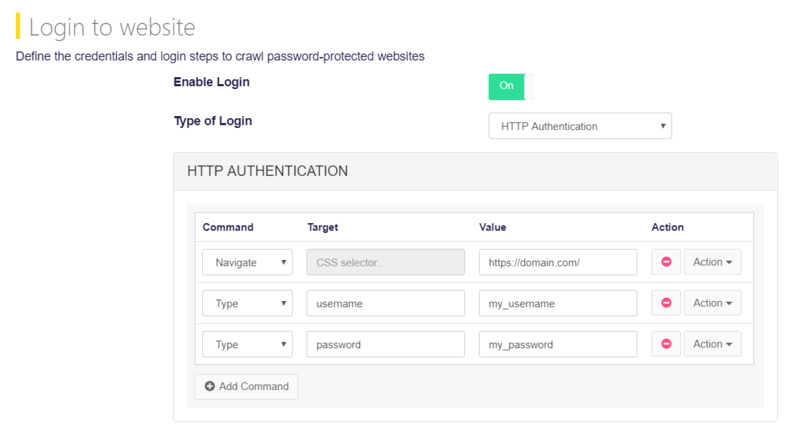 In this tutorial, we will learn how to crawl a password protected website online using Agenty. To crawl a password protected website, first of all we must get authenticated our scraping agent with Username and Password. And then, we can scrape the internal pages as we do with public websites. Scraping the web with Agenty, hosted app is pretty easy and quick to setup using the extension and then we can enter the credentials by editing the scraper in agent editor. This tutorial shows, how to get data from a password protected website after login successfully and then schedule the scraper, to automate your data scraping task. 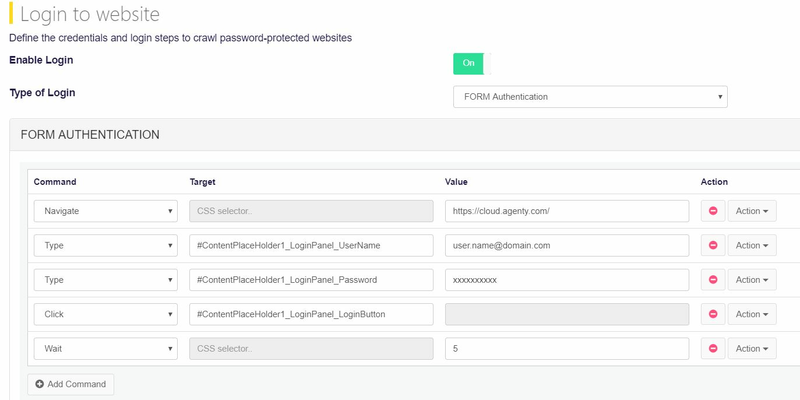 The form-authentication engine in scraping agent has the following commands to interact with a login page using CSS Selectors as the target of any element, this will allow us to complete the initial 1-4 login steps prior to start scraping internal pages. CSS selectors : Selector of text box. Value : Value to enter in the text box. CSS selectors : Selector of dropdown box. Value : Value needs to be selected. Go to Login to website section and Enable login as in the screenshot below. Now go to website you want to login, and check the web page source to analyze the login form. For this tutorial, I'm going to use the cloud.agenty.com itself to demonstrate, so these will the steps I will add to my agent to login successfully. The target CSS selector can be written with name, class or id. For example, to click on the "Sign In" button all these selectors are valid. Once the login configuration part has been completed, save the scraping agent, and scoll up to main agent page to start and test your agent. It's alwasy a best practice to test with few URLs ensure that the agent is login successfully before running a large job. For example, I entered some internal urls in input which was accessible after login only, and then started the scraping job. It's always the best practice to run a test job for few URLs, when the agent configuration has been changed. As that will allow to analyze the result to ensure everything is working as expected, instead starting the agent for big list of URLs. It will take few seconds to initialize and login, then the web scraping agent will start scraping internal pages, and we can see the progress, logs and the final result as per your fields selection in the result output table. The HTTP basic authentication is a simple challenge which a web server can request authentication information (typically a User ID and Password) from a client. These website don't have html web form to type credentials or select using CSS selectors; and then click on submit button. 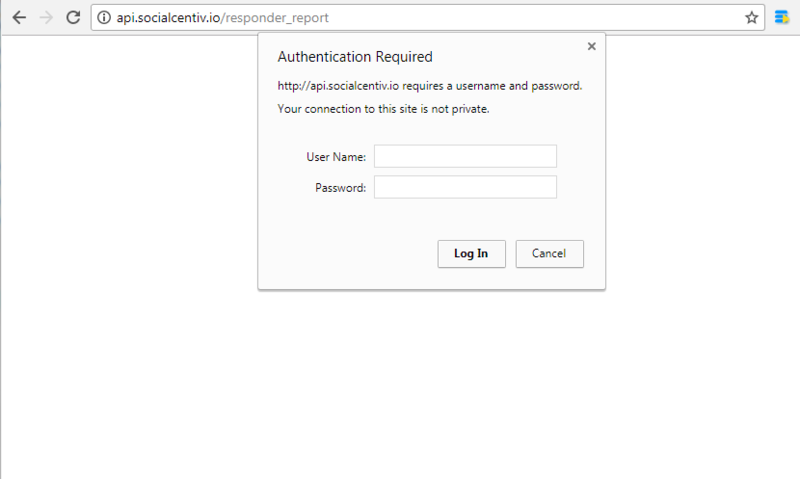 Instead the browser open a popup dialog(as in screenshot below) asking for credentials when you visit the secured pages and then the browser use those credentials to convert into a base64 string and send the Authorization header to server to attempt the login. Enable the Login to website feature and select the Authentication type as "Basic-authentication"
Enter the Domain, Username and password in next section and save the agent back. Go back to main agent and re-run. See the output or logs to ensure the agent is able to login successfully. 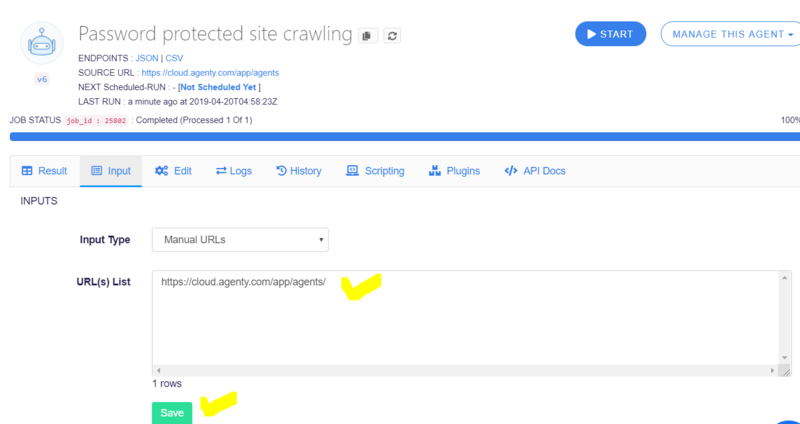 The scraping agent automatically logout to the domain after 20 minutes of in-activity on same domain or if the scraping jobs is completed prior to that. So, if you are using throttling feature to delay in sequential requests, be sure there is no gap of more then 20 minutes. When crawling password protected websites, we recommend to spent some time in analysis first, and try to use the specific login page of website instead dialog box or popup login when possible. You may find that by logging in and then logging out, most of the website auto-redirect users on specific login page when logged out. Add a 5-10 seconds of wait after clicking on "Login" button or form submission to give enough time to website to auto redirect.